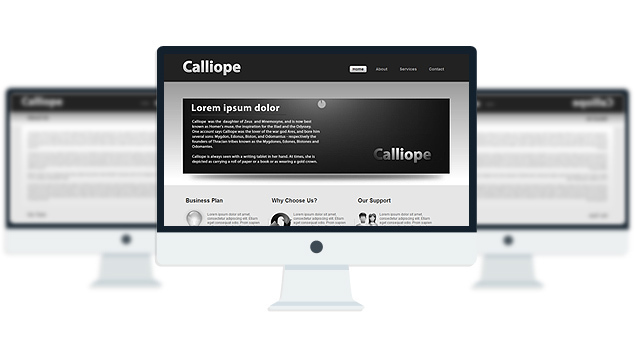 Calliope is a Html/CSS3 Template with Cu3er Slideshow included. Cool!Amazing web template! I chosed among hundreds (or thousands…) By the way is the flash available to modify? Thanks!And keep going the same way! yes! you can modify it. dear all, i am facing a problem with this template .i am using it as a subdomain.when i open the template in my machine from local folder all is well but after uploading it in my server @ http://www.arnabsoft.mobtent.com the animation is not playing in index page.i have check the xml and other files and i also uploaded it multiple times. So i need your help egarly. Love this Template. Is there anyway to get the PSD files so that I could use my own colours? this template is amazing but I am not sure how to modify the flash. I went through all the files through editors and can’t find the text. How do you modify the flash. change the slide1.jpg and slide2.jpg with your image file names. The parent theme is missing. Please install the “Calliope” parent theme. The parent theme is missing. Please install the “Gaia” parent theme. Roy, this is not a wordpres or a joomla theme, this is a xhtml template. how can i add a description text for each of the images? i have added description tag with header value inside silder but it doesnt work for me. any luck? appreciate your help.